I heard a radio documentary a while back about the effect the Arctic conditions of this winter would have on our environment. One result is the lack of food for our native animals and so they would come into urban areas around our houses in order to eke out a dinner. Now I certainly don't live in an urban area......but I have rarely seen a badger/hedgehog/fox in my six years here. That changed this morning. 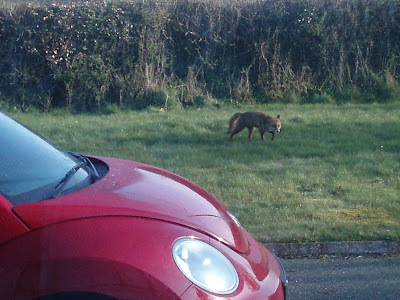 I looked out my kitchen window to see a fox walking as brazen as you like, towards my house. Word has obviously not spread around the animal kingdom that they are wasting their time coming anywhere near my house in search of food. There is none inside it, never mind outside. Old Mother Hubbard seems positively excessive compared to me! "Make something out of that...I dare ya!" Foxy sniffed around for a while, realised that he was wasting his time and wandered off in search of more lucrative pickings. Sure she's cute, but she's not a hen!